The last word in the Bible is ve'ya'al – a call made by the King of Persia to the Jews in the Diaspora to make 'Aliya' ('Aliya' is the noun form of ya'al), meaning a return from the Diaspora to live in the Land of Israel. Ha'apala is the modern Hebrew name given to the clandestine organized Aliya of Jews to the Land of Israel during the British Mandate of Eretz Israel - Palestine. The Ha'apala enterprise is also commonly called Aliya Bet, "Bet" being the first letter of the word "bilti-legalit" which means "illegal". The name Ha'apala is a gerund and a modern interpretation of the verb va'ya'apilu which appears only once in the Bible, in Numbers 14:44, "But they presumed to go up unto the hill top" (va'ya'apilu was translated into 'presumed'). The immigrants who participated in Aliya Bet are called in Hebrew ma'apilim. Aliya Bet was the result of severe restrictions that Britain imposed on immigration of Jews to Palestine. The restrictions had started back in 1922, but became brutal (especially in light of the desperate situation in Europe on the eve of WW-II) with the publication of the White Paper of 1939, which restricted Jewish immigration to mere 10,000 immigrants per year (this quota was later revised up slightly to 1,500 per month). The British authorities allocated immigration certificates according to the quota they set, forcing tens of thousands of Jews to try and arrive illegally, i.e. without the necessary certificates. Aliya Bet started in 1934 following the rise of the Nazi regime, continued even during the difficult period of WW-II, and concluded in May 1948 when Israel became an independent state. The organization in charge of Aliya Bet on behalf of the Jewish Agency was HaMossad LeAliyah Bet, established in 1939 and headed by Shaul Avigur (Meirov) who reported directly to Ben-Gurion. Aliya Bet was conducted in two ways: by sea, from ports and shores in Southern/Eastern Europe and North-African, and by land, through the northern border. Between 1934 and the beginning of WW-II, about 15,000 ma’apilim arrived on board 43 vessels. Two additional vessels were turned away by the British, and two sunk. The vessels came close to the shores and the ma’apilim were taken quickly ashore to escape capture. During WW-II additional 15,000 ma’apilim arrived on board 21 vessels. The ma’apilim, who came from the Balkan countries, first arrived in Turkish ports and from there by land to Palestine (during the war Britain allowed Jews in Turkey to enter Palestine legally). Five more vessels sunk, resulting in 1,583 casualties. The "Golden Age" of Aliya Bet was its post WW-II stage, during the three years between the end of WW-II in Europe in mid 1945 and the declaration of Israel as an independent state on May 14, 1948. During this stage, over 70,000 ma'apilim took part in 66 voyages. The voyages included the most famous voyage by far of the ship Exodus 1947, and the voyage of "The Pans", the most complex voyage, logistically and politically, of Aliya Bet, involving the highest number by far of ma'aplim (over 15,000). There were no major disasters (only two ships sunk, 8 ma'apilim drowned in one of them, the Rafiah), in contrast to the several horrifying disasters of the previous stages. Ten ma’apilim died as a result of clashes with the British forces. The British reaction to Aliya Bet after WW-II was an impressive, and effective, blockade by their Navy of the Palestinian coast. Only 12 Aliya Bet vessels managed to run this blockade, with just 2,108 ma'apilim on board. The rest of the ma’apilim – 66,170 people (this number excludes 1,014 who were allowed to enter legally following the famous "La Spezia Affair" and 1,136 who arrived after May 14, 1948) – were caught and detained by the British. The vast majority of them was detained in special detention camps in Cyprus. Other detention places included the Atlit detention camp south of Haifa, and 2 camps near Hamburg, Germany where the Exodus' ma'apilim were detained. The British gradually released the ma'apilim as part of their allocated monthly quota of certificates (1,500 per month). Aliya Bet after WW-II had a huge impact: it brought the sympathy and support of the world public opinion to the Zionist cause, and demonstrated the resolve of the Jewish people to pursue independence. Thus, it was a major factor (with many historians thinking THE factor) in leading the United Nations to pass its historic resolution of the 29th of November 1947, which paved the way to the establishment of the State of Israel. As an epic human drama Aliya Bet has always been considered a "good story" which many people around the world still find much interest in. Limitation of immigration started with the very beginning of British rule in Palestine. For example, when Dr. Weizmann asked to receive 100 certificates for the immigration of Zionist activists, General Allenby, who had conquered the country and was now its military governor, said: “Now is not a desirable time to advocate increased immigration of Zionists to Palestine. Any aid given to them will be misinterpreted by the Arabs and exploited to the benefit of the Arabs. With the end of British military rule and the start of the British mandatory government, the ability of the Palestinian economy to absorb immigrants became the basis for further immigration. The Jewish Agency agreed to this criterion but in the hands of the British Civil Service this became the main tool for limiting immigration. When Hitler came into power there was a large increase in the demand for immigration and about 50 000 Jews immigrated during the years 1934-1936, but this also was not sufficient. Most of these certificates went to the German Jews and the young Zionists from Poland and Lithuania hardly received any. Under these circumstances, the young Chalutzim (pioneers) and activists of the Betar movement organized their own Aliya (immigration). This was called by the British “illegal immigration”, and marks the beginning, in 1934, of organized clandestine Aliya (this became known in Palestine as Aliya Bet). In reply to the increased amount of Aliya the Arabs started the riots of June, 1936. in order to minimize their importance they were termed “riots” but in effect, this was actually the first Intifada in which the Arabs declared war against Zionism. This war/ riots continued for three years, from 1936 until 1939, and included attacks upon Jewish settlements, shooting upon travelers on the roads and in population centers. It also included an economic boycott, a general strike and an international campaign that was conducted with the assistance of other Arab countries. Britain tried to limit the military activities of the Arab military forces but at the very same time did everything possible to keep Arab sympathy on its side and not have them transfer their loyalty to Germany. At that same time there were increased anti-Semitic activities (Crystalnacht); Austria joined the Reich; there was the meeting in Munich where Chamberlin and the British Government made its peace with the overrunning of Czechoslovakia by Germany. All the Jews of Austria, Germany and Czechoslovakia became desperate to find an asylum. The “enlightened world” gathered at Evian in France in emergency session in order to find a solution to the problem of the Jewish refugees. Prior to the conference the British made a deal with the Americans in which they promised not to demand that the USA change its immigration laws if the Americans do not demand that Great Britain open the gates of Palestine to the Jews. In effect, this conference closed the doors of all the participating nations to the immigration of the Jews. During the year 1939, a German vessel, the St. Louis sailed from Germany with a cargo of 1000 wealthy Jews with the intention of immigrating to Cuba. Before their arrival in Cuba their visas were revoked and they could not land. Efforts to disembark them in the USA failed and their ship returned to Germany where they were all put in concentration camps. During the years 1938-1939, His Majesty’s Government prepared a statement of policy on immigration with the aim of placating the Arabs. Here are quotes of some of the ministers who participated in the discussions of the Committee on Palestine and the British cabinet: “We should not be led (to believe) that because of the recent persecution of the Jews, to take any action, which will prejudice the London discussions.” Cab. Nov.22, 1938. "The fact must be faced that it is essential that we should reach agreement with the Arabs over the Palestine question…" Foreign Secretary Dec. 14, 1938. The Prime Minister concluded, "If we must offend one side, let us offend the Jews rather than the Arabs." Section 4 … His Majesty’s Government declares in no uncertain way that it is not its policy to turn Palestine into a Jewish State. Section 14.1. During the next five years Jewish immigration will be 75,000 immigrants. 14.3. For the five years following [i.e. from 1944] no more Jewish immigration will be allowed unless the Arabs will acquiesce to it." The Zionist Organization saw this “paper” as a Declaration of War. In August 1939 the Hagana (The Jewish Underground Defense forces in Palestine) sank a British naval vessel that was used to hunt ships carrying ma'apilim. However, three months after the publication of the “White Paper” WW-II broke out and the Jewish settlement in Palestine was interested in joining the British in the fight against the Nazis. 30 000 young men and women from the Jewish Settlement in Palestine (the Yishuv) volunteered to serve in the British Army. The Palmach was established with the aid of the British; the 23 young sailors sailed under the command of a British officer to sabotage a Lebanese installation (and were never again heard of); a unit of the Etzel was sent on a mission for the British to Iraq. The Yishuv in Palestine was Great Britain’s most loyal supporter in this region or anywhere in the world. This did not change the attitude of the British Government to any extent and the White Paper policy remained in effect and was executed to the letter. The British worked diligently to prevent Jews from leaving the countries in which their lives were threatened and did their best to see that those that did succeed in fleeing received no further aid. They used their influence to see that they could not transfer to neutral countries and they did not allow them entry to Palestine even if they had certificates or if they came from German-held countries, on the grounds that they were possible enemy aliens. Immigrant ships were detained in the Danube and in the Bosporus and in Palestinian ports on the grounds that there were enemy spies among the immigrants. Immigrants on the ship, the Atlantic were exiled to Mauritius and The Struma was refused entry and returned to the Black Sea, where it sunk with all its passengers on board. When the reports of the systematic killing of the Jews of Europe became known it was apparent that immigration was now a desperate necessity to save lives. 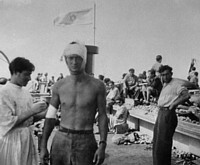 In 1943 a sea-going arm of the Palmach was established, the Palyam, and recruits were trained to take part in naval operations. Courses for ships’ captains and other sea going trades were conducted so that the Palyam would be able to bring ma'apilim to Palestine and Jewish soldiers in the British Army also organized to bring the ma'apilim from displaced persons centers to the Mediterranean ports. Radio operators also were trained so that contact could be maintained between the ships and the Hagana command. In 1944, when the Soviet Army started its advance to the West, following the German defeat at Stalingrad, the remnants of the Holocaust started to move. Those that were in the Eastern European countries started to move in the direction of Western Europe and the Mediterranean, or the Black Sea, as the start of their journey to the Land of Israel. These desperate and helpless Jews saw Palestine as their only ray of hope. The Zionist youth movements were in the forefront of this awakening. At first the word Tiyul (hike) was used, to disguise the true purpose of the movement from the Soviets. In a short time this became a mass movement of people and was coordinated by emissaries from the Yishuv in Palestine. The term, Tiyul, was changed to the Hebrew word Bricha (escape), and was directed by the Organization for Aliya Bet (Ha'Mossad Le'Aliya Bet). At the end of WW-II there were 6 million homeless people in Europe; among them were 50,000 Jews who were remnants of the extermination camps. One year later there were only 1 million homeless people but the number of Jews among them had grown to 300,000. People of other nationalities returned to their homelands but the Jews had nowhere to return to. Jews who had been with the partisans or had been hiding in forests; or who were hiding in monasteries in various countries, gathered in a rising stream and moved in the direction of Aliya, immigration to Palestine. That was the only path left to them despite the White Paper. The world was changed following the end of the World War and the British Empire had many problems to solve but the only policy that remained steadfast was the White Paper and the limitation of immigration to Palestine. The British armed forces increased pressure on various countries to halt the Bricha and Aliya Bet and to prevent the Jews from procuring vessels that would take ma'apilim to Palestine. •	In Poland, the British appealed to the (Communist) Government to prevent the Jews from leaving the country and to pressurize the Church to denounce anti-Semitism so that the Jews would not leave the country. •	In Rumania, Hungary, Bulgaria and Yugoslavia great efforts were made to prevent the Jews from crossing their borders on their way to the West. •	In Italy, Greece and France they tried to prevent the Jews from entering those countries, and to prevent them from leaving those countries on ships. •	In the USA they tried to have the government remove the tax-free clause from the Jewish campaigns because that money went to help the immigration of Jews. •	They kept a watchful eye on the purchase of ships anywhere so that they would be aware of what came into the possession of the Jewish Underground. •	In the Mediterranean countries they tried to prevent the Jews from obtaining crews to man the Aliya Bet ships. The British could not ignore the problem of the Jewish refugees but they tried to separate between the refugee problem and Palestine as the solution. They could not bring themselves to the conclusion that these two problems were in reality only one problem. The policy of the Civil Service did not take into account the desperately deep feeling of the remnants of the Holocaust for Eretz Israel, the Land of Israel. The Jews saw Palestine as the only land in which they could renew their lives. This was the result of years of suffering and despair, where Palestine remained their only hope. The Jewish settlement in Palestine was the tool, the catalyst which turned the energy and the desires of the remnants of the Holocaust into a steady stream of Aliya to Palestine so that they could rebuild their lives and build the State of Israel at the same time. The British thought that the difficulties of the voyage to Palestine and the trials of imprisonment in Atlit and of the banishment to Cyprus would frustrate the ma'apilim so that they would give up on the whole venture. The British also hoped that the capture of the ships and the reduction of certificates due to the unlawful entry of ma'apilim would frustrate the Hagana command and show them the futility of their efforts, but Aliya Bet ships kept coming, and with an ever-growing number of ma'apilim. In cabinet discussions on the subject, Field Marshall Montgomery, the hero of El Alamein and the head of the British Armed Forces, guaranteed that the British Navy would prevent ships from reaching the shores of Palestine and that the Army would be able to control the Yishuv in the event of mass rioting. The Royal Navy was not enthralled by the task it was to perform in this operation. All would have preferred that the soldiers go home after the war was over, but now they had to prepare for their new duties and they did this care. 49 ships were assigned to this task of fighting Aliya Bet; 9 coastal vessels, 21 destroyers, 8 frigates and 11 mine sweepers. At the naval base in Malta a special training camp was established to teach the sailors and marines how to overcome a ship loaded with human beings. The training was specific to taking the bridge, the engine room, the communications center, etc. Among the tutors there was always a sergeant or officer of the Palestine Police who lectured upon Palestinian (Jewish) terrorist activities. British sailors were very surprised when in the field of action they did not meet any terrorists on the ships but had to fight against young girls and boys or old women and men, all dressed in rags, and they did not see any hard-boiled terrorists. In general, the navy men tried to act with restraint and there were only a few incidents of the use of greater force than necessary. There were also cases when kindness and consideration were shown. 1. Most important was the desire of the remnants of the Holocaust to reach Palestine and rebuild their lives and build the State of Israel. 2. The British, for their own reasons, could not agree to Aliya Bet. 3. The Jewish Yishuv in Palestine mobilized itself to the task of bringing the remnants of the Holocaust to Palestine and mobilized Jewry of Europe and the United States in order to achieve this goal. Nathan Alterman: "A Response To An Italian Captain"